It’s great, is all I’m saying. Now on to pie crust. I like to walk my readers through making pie crust, because I feel like so many people are like “Pie crust? Who has the time for that! 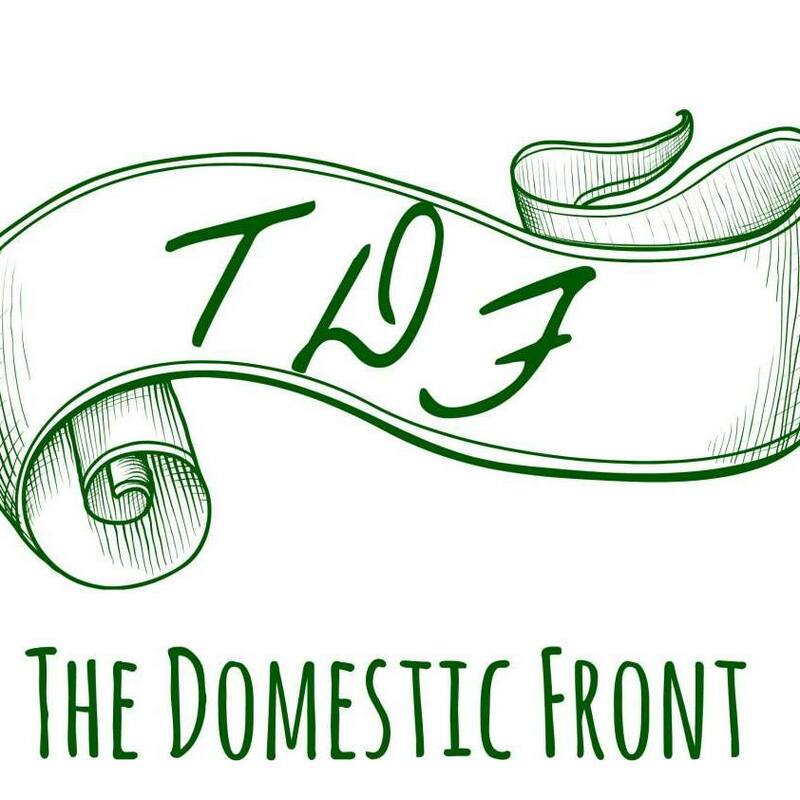 It’s too hard!” and I want to pat your head and say, “No, it’s OK – you can do it.” You don’t have to own a walk in freezer or live in the arctic to make your pie dough (though it is a bit tougher on a warm day.) You don’t have to source special kinds of lard or NOT TOUCH IT OR IT WILL BE OVERWORKED. Pie crust is pretty forgiving. If it cracks? Patch it. If you can’t roll it out in a perfect circle? Nobody cares. At the end of the day you will have pie, and people will love you. This is the way I’ve been making my pie crusts, and it works pretty darn well. First step — food processor. You might not have one – you can use a bowl and a pastry blender for this step. If you don’t have a pastry blender and you want to bake pie, just buy one – they’re like ten bucks. (I also use it for biscuits and scones). Combine flour, a little sugar, and salt in the bowl of your food processor. 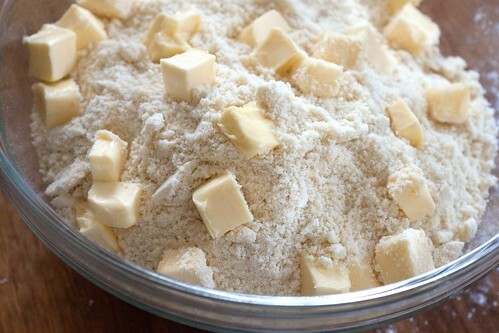 Cut 2/3 of your butter into cubes, and pulse in the food processor until the mixture resembles coarse sand. Dump out the mixture into a bowl, and add the rest of your butter, cut into small cubes. A note about butter: Butter tastes way better than shortening, and Kerrygold Butter tastes better than most other butters you can buy. It has a higher fat content than American butters, and it’s pretty widely available. If I’m going to make pie, I just go ahead and buy Kerrygold. One 8 oz. cube is enough for a double crust pie. You should, too. It’s just better. I’m not even being paid for this. I just like it. Then you take cold water, and if you like, cold vodka or another high proof liquor (I use plum brandy because I have a bottle and I don’t really like it. You can taste the flavor in the raw dough but it’s undetectable once it’s baked), and stir it in with a fork. My dough tends to be on the wet side – I think it’s easier to work with, and I live in a dry climate, so my flour doesn’t add a lot of moisture. (The vodka is a suggestion from Cook’s Illustrated. I have no idea if it actually works better, but it goes in my “why not?” category. The dough will be pretty easy at this point to form into two balls that you can then flatten into round disks. Put the disks in the refrigerator for at least an hour. I roll out the disks on a floured surface (my kitchen table). The key here is to move the crust pretty often so you’re not rolling it out and letting it stick to your surface. Again, if it cracks, pinch it together. Don’t roll it too think – I would say mine is probably about 1/8th inch thick. Again, it’s OK if the edges are irregular, but you want it to be bigger than your pie plate. Lift the crust into the pie plate (you can loosely roll it around your rolling pin and unroll it into the plate if it’s easier, and lift it down into the plate’s center (If you stretch it, it will shrink.) Fill your pie, then repeat the rolling out process with your second disk, and lift that over the filling. 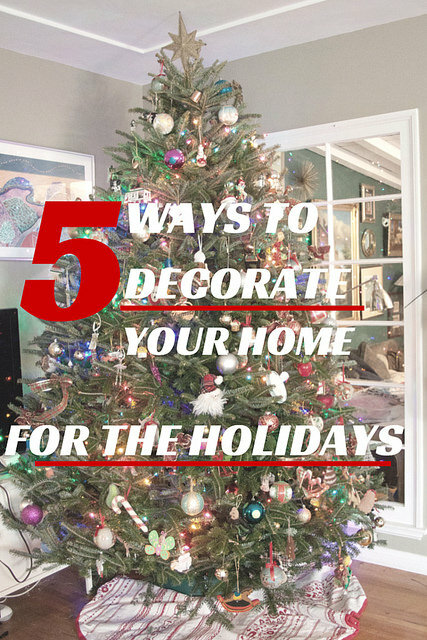 Using scissors, trim the edges to a little past the lip of the pie plate, then fold the edges together to seal and pinch them into a nice pattern. Use the scissors to snip vents in the crust as well. 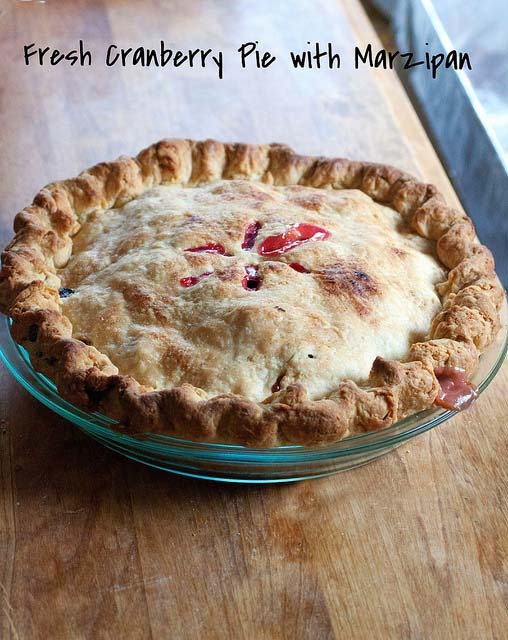 Back to the cranberry pie – I use a pyrex plate for all my pies, and the bottom crust usually stays pretty crisp. For this pie, I thought I’d try a trick I read about somewhere and lined the crust with a thin layer of marzipan. I loved the flavor addition, and the crust stayed super crisp. Also, cranberries, like apples, shrink a lot during cooking, and there was a gap between my top crust and my cooked fruit. This didn’t really bother me, but if it bothers you, I think this is a fine candidate for a lattice top pie. 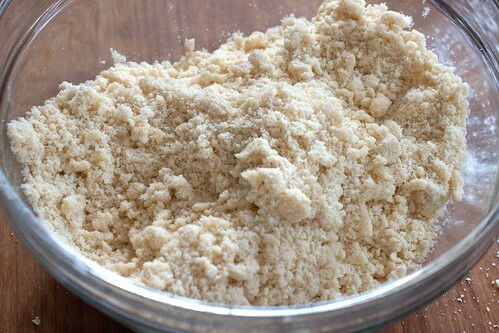 In the bowl of a food processor, combine the flour, sugar and salt. Cut 6 ounces of the butter into small cubes, and pulse with the flour in the food processor until the mixture resembles coarse sand. Dump it into a bowl. Add the remaining butter, cut into cubes, and using your hands, rub the butter into the flour until all the pieces are flattened and the mixture is crumbly. Pour in the water and the vodka, and stir with a fork until the mixture comes together. Divide into two balls, flatten into disks, and refrigerate at least an hour. Let soften slightly before rolling out on a floured surface. Roll the pie crust and place into a 9 inch glass pie plate. 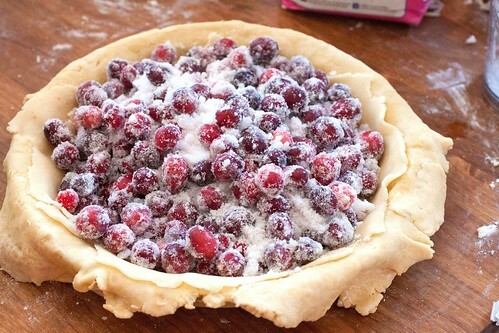 Lay the marzipan over the bottom crust, then pile the cranberry filling into the bottom crust. Roll out the top crust and place it over the filling. 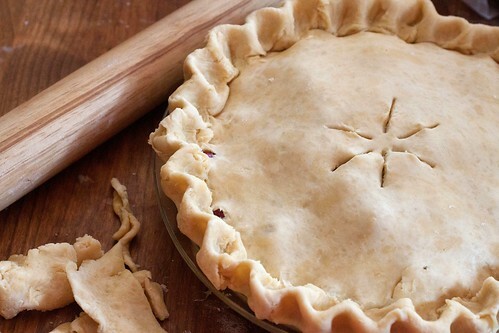 Trim the edges to about ¾ inch beyond your pie plate, and press the top and bottom crusts together to seal. Use your fingers to flute the crust. Cut vents in the top of the pie crust. 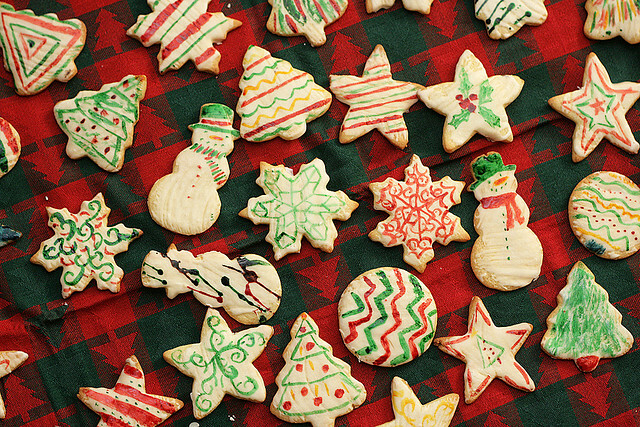 Sprinkle with sugar, and bake 40-50 minutes, or until the crust is golden brown. What do I do with the marzipan besides chill it in the fridge?! D’oh Jenni! Thanks for catching that. I was so out of it Friday that I accidentally posted the post without the recipe. It’s fixed now. 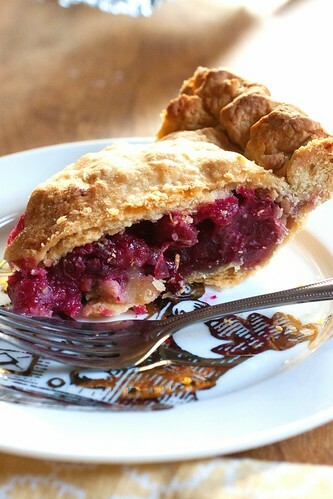 I would like to try cranberry pie please!!!! I made this and we had it after thanksgiving as our “experimental pie”. It was fantastic and will be a yearly go-to for me. Thanks so much…we loved it.